Hello glowing cheeks! From America's #1 scrub brand, this multi-award winner contains 100% natural walnut shell powder to deeply exfoliate for clean, glowing skin. You know this as the apricot scrub that deeply exfoliates for clean, smooth and glowing skin. Made with 100% natural exfoliants (like walnut shell powder) and apricot fruit extract, known to help leave skin feeling super soft and smooth. This is a 3&acirc;4 times a week kind of a scrub, for refreshed, glowing skin. Apricots are our thing. So we know those deliciously fuzzy fruits well. They come from sun-drenched California and North Africa from juicy fruits from different crops, any time of year. Our walnuts are grown in orchards in California, and harvested in the fall where the shells are milled into a fine powder so they have specially rounded edges, which means a softer scrub. Just the way we like it. Natural ingredients Apricot Fruit extract Walnut shell powder Corn kernel How to use: Dispense scrub onto fingertips and massage onto damp skin. Spread in small circular motions to wake your skin&acirc;s natural circulation. When you&acirc;re done, rinse and glow! For best results, use 3-4 times a week. *Based on 52 week unit sales ending 7.30.16 . Hello glowing cheeks! From America's #1 scrub brand, this multi-award winner contains 100% natural walnut shell powder to deeply exfoliate for clean, glowing skin. You know this as the apricot scrub that deeply exfoliates for clean, smooth and glowing skin. Made with 100% natural exfoliants (like walnut shell powder) and apricot fruit extract, known to help leave skin feeling super soft and smooth. This is a 3â4 times a week kind of a scrub, for refreshed, glowing skin. Apricots are our thing. So we know those deliciously fuzzy fruits well. They come from sun-drenched California and North Africa from juicy fruits from different crops, any time of year. Our walnuts are grown in orchards in California, and harvested in the fall where the shells are milled into a fine powder so they have specially rounded edges, which means a softer scrub. Just the way we like it. Natural ingredients Apricot Fruit extract Walnut shell powder Corn kernel How to use: Dispense scrub onto fingertips and massage onto damp skin. Spread in small circular motions to wake your skinâs natural circulation. When youâre done, rinse and glow! For best results, use 3-4 times a week. *Based on 52 week unit sales ending 7.30.16 . Tell me more! This scrub is dermatologist tested, paraben free, non-comedogenic (not tending to cause blocked pores), and oil free. WARNING: AVOID DIRECT CONTACT WITH EYES. IF CONTACT OCCURS, RINSE THOROUGHLY WITH WATER. Ingredients: Water, Juglans Reiga (Walnut) Shell Powder, Glyceryl Stearate, Glycerin, Sodium Lauryl Sulfoacetate, Zea Mays (Corn) Kernel Meal, Cocamidopropyl Betaine, Cetearyl Alcohol, Cetyl Alcohol, PEG-100 Stearate, Prunus Armeniaca (Apricot) Fruit Extract, Cetyl Acetate, Polysorbate 60, Ceteareth-20, Acetylated Lanolin Alcohol, Carbomer, PPG-2 Methyl Ether, Phenethyl Alcohol, Triethanolamine, Methylisothiazolinone, Fragrance, Titanium Dioxide. Instructions: Moisten face with water. Dispense product onto fingertips and massage over face. Rinse with water. Avoid direct contact with eyes. In case of contact with eyes, flush thoroughly with water. For best results, use 3 to 4 times per week. I have used the medicated apricot face scrub and the firming lotion for years now, and I get so many compliments on my skin and how young I look. I just turned 50! Your products are natural AND affordable as compared to the over priced "fancy brands." 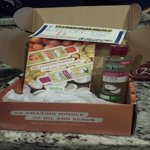 I LOVE your products!! :) THANK YOU!! 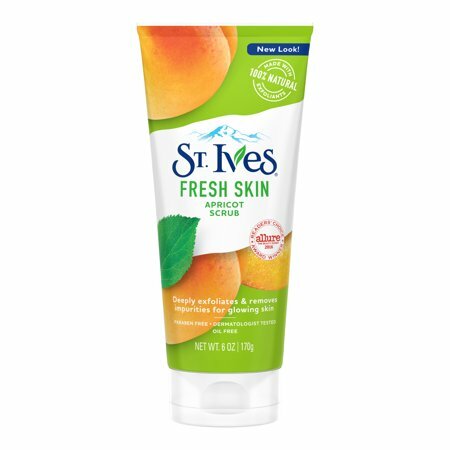 My favorite St. Ives product by far is the Apricot Scrub. Growing up I never had skin issues, so most of my facial cleanser were more maintenance for me than correcting an issue. However, last year my skin started going through changes and I would get the worst break-outs. I tried three different cleaners, including the infamous "black soap" which is supposed to be the best at cleaning your skin and correcting skin issues. Nothing worked. I used the Apricot Scrub sporadically. Not sure why I decided to try using it more often, but it was the best thing ever for my skin. Now, i use it twice a day and the results are amazing. I get so many compliments on my skin and my new "glow". Aside from the fact that I met Mr. Wonderful and will be marrying him next month (huge smile) my glow is also in part to using the apricot scrub daily! So I have been seeing this on tv and decided I needed a facial cleanser and bought it today and I am really loving my results it does exactly what it says on tv and makes my skin feel really smooth and very clean and refreshed I love st ives!! 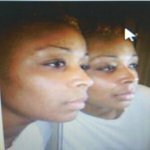 I've been using this cream since 2005 it has dramatically change my life for the best !!! my face had acne marks and was broke out so badly my face had since cleared up had since then had very few break out.